Is this the cutest crochet girls coat you ever did see? We have fallen head over heels and you will too. Who will you be making one for? 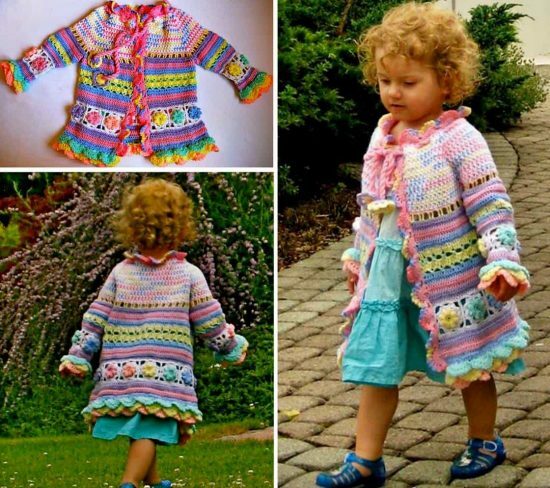 We were thrilled to find this adorable light-weight little girls summer coat on the Ravelry Site. Imagine our delight when we discovered it was a fabulous free pattern! It has to be one of the sweetest we have seen in a long time. The layering, the texture, scalloped elements ensure it’s a must make! This is a beautiful piece and the elements are the perfect combination. It really is just so sweet! The above photo is a lovely close up which shows you precisely the exquisite detail in this girls crochet coat. It is certainly going to challenge your skills but when you see the finished product, the effort will definitely be worth it. 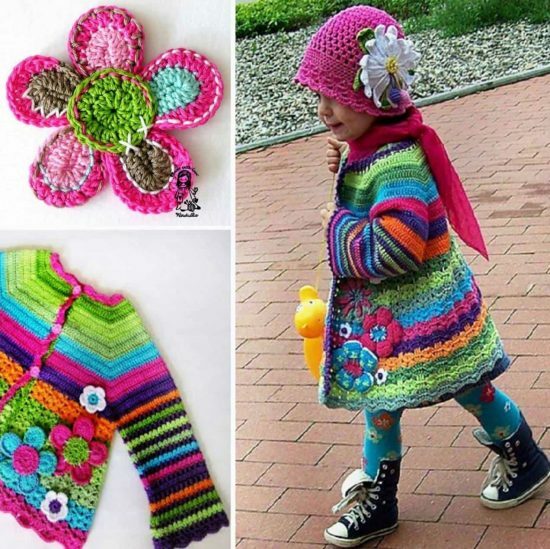 You could make this crochet girls coat in brighter colors or pastel colors, whatever you prefer. One thing’s for sure, we know that you are going to love the stunning results. “A unique masterpiece with total fascination guarantee! Crocheting this piece is a lot of fun as you work with a variety of colors, patterns, and shapes. Thanks to its wide shape the coat can be worn by your kid for several years: as a long coat for a 1.5-year-old or as a jacket with ¾ sleeves for a 7-year-old. Keep scrolling and pinning as you go. There are more adorable creations that you won’t want to miss. 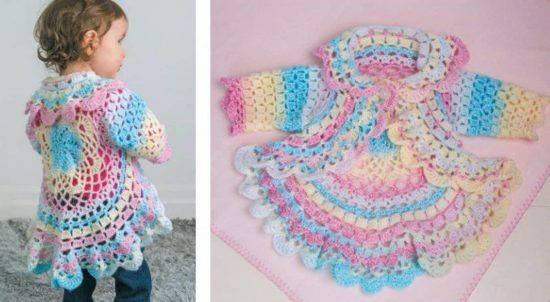 Continue scrolling our page, we have included this other very popular Girls Crochet Rainbow Coat. This has been hugely popular and don’t you just love it!